Tuesday was a great day for the UNC baseball team, as a walk-off home run from Dylan Enwiller gave the Tar Heels a 4-3 win over UNC-Wilmington. 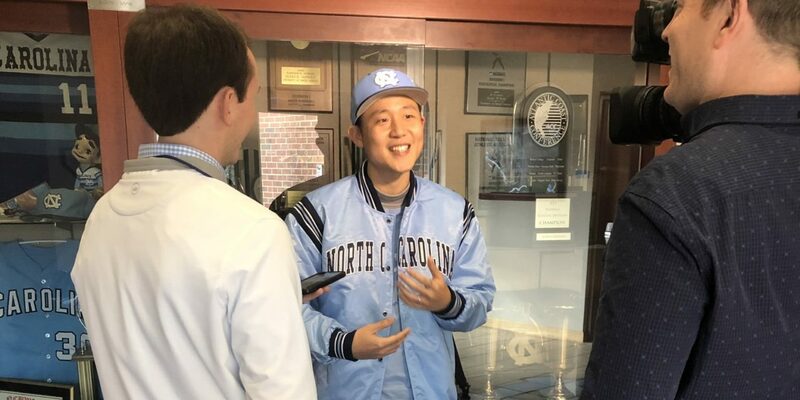 It was also a special day for Chut Techalertavorkul, a UNC fan from Thailand who made the journey to Chapel Hill to watch the Tar Heels’ baseball team win a thriller over the Seahawks. The story went viral on Tuesday afternoon when a user on Inside Carolina’s message board posted about Chut’s love for the Tar Heels, which stemmed from his first trip to see the baseball team play in the NCAA Regionals in Greensboro. After Chut returned to Thailand, he continued to listen to UNC athletics through online streaming. KCUNCFAN shared that when Chut got married to his wife, Pong, the color at their wedding was Carolina blue. Upon learning he would be traveling back to Chapel Hill, Chut was asked to throw out the first pitch at UNC’s game versus UNC-Wilmington. The only problem? Chut had not thrown a baseball in his life. “He went to every store in Bangkok that might possibly have a baseball, but no luck,” KCUNCFAN wrote. “Finally, a friend went to Japan on vacation, and brought back a ball for him. He and his wife went to the park to practice. Of course, they have no baseball glove, so Pong took along her oven mitt! Upon arriving at Boshamer Stadium, Chut was greeted by coach Mike Fox and received new UNC baseball gear before throwing out the first pitch to Michael Busch. It was a great day to be in Chapel Hill, as Enwiller’s walk-off home run kept the baseball team undefeated and Coby White’s 34 points helped the basketball team hold off Syracuse in the Dean Smith Center. Oven mitt. I love that part.